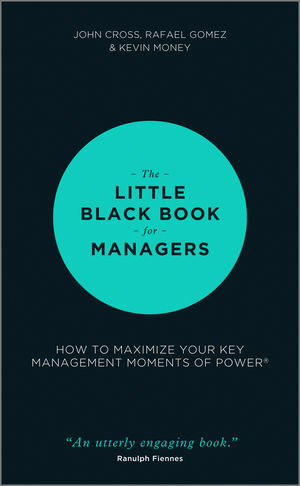 A smart, small book for any manager’s pocket. John Cross has designed and delivered learning and development programmes and has the real-world practitioner experience — RAF instructor, sales director, marketing director and business owner. He spent 15 years as a middle manager before starting his own training business. Kevin Money is Associate Professor at Henley Business School. He is the Director of the John Madejski Centre for Reputation and teaches on the MBA programme (6000 students). He is mentor and tutor in Henley's Advanced Management Programme. He is also a chartered psychologist, NLP practitioner and Director of the Positive Psychology Forum. He regularly speaks to both academic and practitioner audiences eg World Marketing Congress, BSkyB and the Future Leaders event. Rafael Gomez has previously taught Management at the London School of Economics and is currently Associate Professor in Industrial Relations and Human Resources at the University of Toronto. He has worked with both public and private sector organizations and presented his findings at 50 national and international conferences. He is a member of a number of related associations.